His last and best opponent was a machine, Chinook, designed by University of Alberta computer scientist Jonathan Schaeffer. 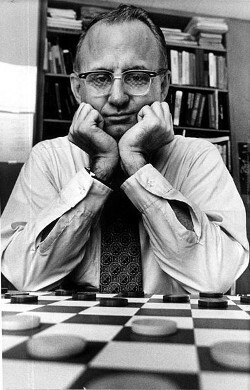 When the American Checkers Federation refused to let a machine play for the championship in 1990, the sporting Tinsley resigned his crown and immediately accepted the match. But the machine kept improving, and Tinsley’s health began to fail. He had to withdraw after six draws in their 1994 rematch, and he died of pancreatic cancer shortly afterward at age 68. Chinook has since solved the game — after 18 years of thinking, it produced a map that would show it a non-losing move in any situation. In principle, at least, the computer is now invincible — the best a human can hope for is a draw.